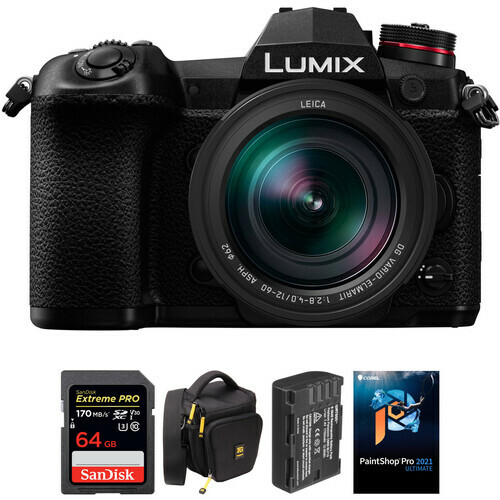 A well-rounded bundle to get you started shooting, the Panasonic Lumix DC-G9 Mirrorless Micro Four Thirds Digital Camera with 12-60mm Lens and Accessories Kit from B&H pairs the multimedia mirrorless body and standard zoom lens with a protective camera bag, a memory card, and a copy of Corel PaintShop Pro 2019 Ultimate editing software. 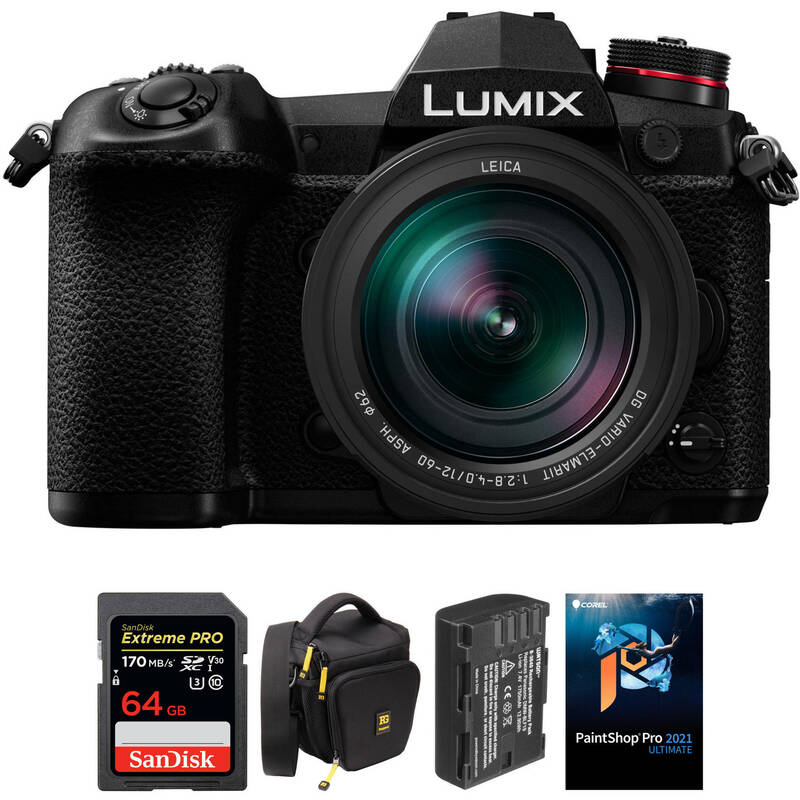 Panasonic has taken a different approach to camera development with the stills-focused DC-G9 Micro Four Thirds Mirrorless Camera, which has a variety of newly developed functions and features that will appeal to photographers. Central to the imaging process is the combination of a 20.3MP Live MOS sensor and the latest Venus Engine processor, enabling the capture of sharp images and video with sensitivities ranging up to ISO 25600. Extremely fast speeds are also made available with up to 60 fps continuous shooting with the electronic shutter function. If you want to shoot video along with stills the G9 is very accommodating, offering UHD 4K at up to 60p. This improved speed is seen in many different aspects, including an enhanced Depth-from-Defocus autofocus system with 225 areas for fast, precise focusing across the frame. A rear joystick has been implemented as well for intuitive control over the current focus point. Another benefit of boosted processing is the inclusion of 6K PHOTO at 30 fps and 4K PHOTO at up to 60 fps, allowing users to capture 18MP or 8MP images, respectively, at exceptional frame rates. Beyond speed, the 5-axis sensor stabilization system supports Dual I.S. 2.0 and can compensate for up to six stops of camera shake. And a significant addition made possible with this new system is a multi-shot mode that captures eight separate images and compiles them into a single 80MP raw image. It isn't just performance that has been optimized, as the G9 has a redesigned body that is splash, dust, and freezeproof. The body gains a top status LCD for quick access to essential settings without needing to check the LCD or viewfinder, which have also been improved. Most notably, the OLED viewfinder is improved with a 0.83x magnification and 3.68m-dot resolution. The EVF has a fast 120 fps refresh rate as well for lag-free viewing. Additionally, the LCD is now a 3.0" 1.04m-dot free-angle touchscreen for working intuitively and at odd angles. Optimized for high-speed high-resolution imaging, the G9 packs in both a 20.3MP Light MOS Micro Four Thirds sensor and an enhanced Venus Engine processor to create sharp, detailed stills and UHD 4K video. This configuration maximizes resolution while keeping noise to a minimum, permitting the use of sensitivities up to ISO 25600. It is also very fast, enabling continuous shooting rates of up to 60 fps with AF-S and 20 fps with AF-C when using the G9's electronic shutter or 12 fps for AF-S and 9 fps for AF-C using the mechanical shutter. Supplementing the camera's stellar stills feature set is UHD 4K video recording at up to 60p. The G9 offers internal recording with an 8-bit color depth and 4:2:0 sampling using Long GOP compression to keep files sizes manageable. Users also have access to various frame rates, including 60p, 30p, and 24p in UHD 4K and 60p and 24p in Full HD. Slow motion video is available in the Creative Video Mode with support for 60 and 48 fps resolution in UHD 4K and up to 180 fps in Full HD. In order to maximize image quality, the G9 features a full-size HDMI output for using an optional external recorder to receive 8-bit 4:2:2 footage at all resolutions up to UHD 4K at 30p. Also, both a 3.5mm headphone jack and 3.5mm microphone input are available for improving audio capture. Helping to achieve the utmost sharpness when photographing handheld, Dual I.S. 2 combines the G9's sensor-shift image stabilization technology with lens-based image stabilization to compensate for a broader range of movement types to render sharper, clearer imagery. Dual I.S. 2 requires the use of compatible Lumix lenses featuring O.I.S. This stabilization system is able to compensate for approximately six stops of camera shake. A large OLED Live View Finder has an impressive 3.86m-dot resolution and 0.83x magnification for eye-level composition. This viewfinder also has a maximum refresh rate of 120 fps for clear, lag-free imagery. A larger means for image composition and playback, the 3.0" 1.04m-dot rear LCD monitor has a free angle, tilt and swivel design to support viewing from a variety of angles. It is also a touchscreen, which permits intuitive menu navigation and settings control. Dual UHS-II SD card slots are present, which provides settings such as Relay Recording to automatically switch cards when one is full; Backup Recording, which records the same data to both cards simultaneously; and Allocation Recording, which lets you save certain files to each card for easier organization. The sleek flat-body profile incorporates both front and rear dials for intuitive control over aperture and shutter speed settings. Multiple assignable function buttons are also available, including a function lever. Included with the camera body is the Leica DG Vario-Elmarit 12-60mm f/2.8-4 ASPH. POWER O.I.S. lens; a 24-120mm equivalent zoom spanning wide-angle to short telephoto perspectives. This versatile optic, which has been designed in collaboration with Leica, features a series of aspherical and extra-low dispersion elements to greatly reduce spherical and chromatic aberrations throughout the zoom range. Its linear motor offers quick and quiet autofocus performance while the POWER Optical Image Stabilizer system helps to minimize the appearance of camera shake. Additionally, matching the camera body's design, the lens is also splash, dust, and freeze-proof to enable its use in trying environmental conditions. For accelerated autofocus performance, and Advanced DFD (Depth-From-Defocus) technology is employed to quickly calculate the distance to subjects and adjust the focusing position in as little as 0.04 seconds, which enables continuous shooting up to 20 fps with continuous AF. This contrast-detection type focus method benefits both still and video recording modes, as well as subject tracking applications where subject color, size, and motion vectors are used to intelligently lock-onto the moving subjects and ensure precise focus. The sensitivity and speed can be adjusted to further improve performance with certain subjects. It also features 225 AF areas, which provide excellent control over where the camera will focus. Additionally, supporting working in low-light conditions, a Starlight AF feature enables accurate AF performance down to -4 EV. By using sensor-shift stabilization technology the G9 can use a High Resolution Mode to capture and compile eight separate images to create a single 80MP raw file. This system creates a more highly detailed and color accurate image than a single shot alone can produce and can create an image with a 10368 x 7776 resolution. A Night Mode will automatically adjust brightness of the EVF and LCD for comfortable viewing in low-light conditions. Designed for SD devices that can capture Full HD, 3D, and 4K video, as well as raw and burst photography, the 64GB Extreme UHS-I SDXC Memory Card from SanDisk has a capacity of 64GB, is compatible with the UHS-I bus, and features a speed class rating of V30, which guarantees minimum write speeds of 30 MB/s. If your device does not support the V30 standard, this card also supports the U3 standard, which likewise guarantees minimum write speeds of 30 MB/s. Read speeds are supported up to 150 MB/s and write speeds max out at 60 MB/s. A built-in write-protect switch helps to safeguard against the accidental erasure of card data. Corel PaintShop Pro 2019 Ultimate is a comprehensive photo editing, image management, and graphic design software, along with a bonus pack of four additional programs—PhotoMirage Express, Painter Essentials 6, Perfectly Clear 3.5 SE, and AfterShot 3—for a thorough range of post-production capabilities. The 2019 version of this application sees updates to performance speeds, with faster, more intuitive, and versatile tools, as well as a simplified user experience and a greater range of creative capabilities. Individual tools have been optimized for greater control, including the Crop tool, which now has faster performance along with the ability to apply several enhancement features during the cropping process. Additionally, support has been added for 360° imagery along with new brushes, palettes, gradients, patterns, and picture tubes for a richer range of adjustments and effects you can apply to your photos. Faster Crop tool performance takes greater advantage of the computer's GPU for 5x more responsive cropping, rotating, and positioning. One-Step Photo Fix has been improved for faster processing times and the ability to automatically apply several corrections to an image at once. Improved support for 4K content and higher resolution monitors means user interface text will appear larger when necessary for easier navigation. Updated compatibility for the latest WinTab-aware graphics tablets as well as Windows Ink for more editing flexibility and control. Autosave has been enhanced for fewer interruptions, a more overall subtle experience, and the ability to control the frequency of autosaving. Seamless content and plug-in migration from previous versions lets you easily carry over your settings, plug-ins, brush tips, color palettes, gradients, patterns, textures, and effects via the Import Content from Previous Versions menu option. Some of the most often used enhancement features can now be used in conjunction with the Crop tool, including Instant Effects, One-Step Photo Fix, and Depth of Field options, to quicken your editing workflow. The user interface text size can now be adjusted, with Small or Large settings, to suit your needs. Pic-to-Painting presets make use of Deep Neural Networks to analyze individual images and convert them into digital artworks with the ability to select from a variety of creative presets that mimic well-known painting styles. Photographs taken from 360° cameras can be edited, straightened with rotation, made to appear level, and you can easily remove and replace the tripod in the image using Magic Fill to produce unique planet-like effects. New brushes, color palettes, gradients, patterns, and picture tubes have been added to the 2019 edition for even greater creativity. Included with PaintShop Pro 2019 is a bonus quartet of additional applications to further round out your post-production capabilities. PhotoMirage Express lets you turn any image into an animation and then share them directly to social media for a more dynamic viewing experience. Painter Essentials 6 is a photo-painting software that transforms your photographs into illustrative-styled digital art. Alternatively, you can use a wide range of brushes and other tools to sketch, draw, and paint from scratch, as well as apply various painting styles and effects to your finished works. Perfectly Clear 3.5 SE helps to restore detail, color, and other details in a quick and efficient manner. Using a sophisticated set of presets, you can develop a custom look for your photos, comprised of multiple adjustments, and apply this look to groups of images in a single click. AfterShot 3 is a dedicated raw file processor for editing and enhancing your photo library. Image adjustments can be made to single files or an advanced batch processing function lets you apply corrections to large groups of photos at once. Using PaintShop Pro's Camera RAW Lab, you have complete processing control over your raw files, including the ability to see before and after views and work with a large preview option. Multiple exposures of the same scene can be blended using HDR tools for extending the apparent dynamic range and gaining greater shadow and highlight detail. Lens Correction tools can be automatically or manually applied to correct distortions, vignetting, and chromatic aberrations introduced by many lenses. Scripts allow you to automate repetitive tasks for a faster, more efficient workflow. Makeover tools help to eliminate red-eye, blemishes, and unwanted lines, as well as smooth wrinkles, whiten teeth, and even-out skin tones. Batch Processing lets you apply the same adjustment to several files at once. One Step Photo Fix is a single-click method to automatically apply corrections and Smart Photo Fix lets you apply automatic adjustments with one click, too, but with the ability to fine-tune the suggested settings. Crop photos using the range of new compositional guides and also re-orient crooked photos or straighten perspectives. Instant, Preset Effect can be quickly applied and have been organized into style categories, such as Artistic, Film Styles, Black & White, and Landscape, for easy access. Retro Lab helps to achieve desirable vintage-looking photos by applying color and contrast effects to mimic a lo-fi retro look. A Graduated Filter tool lets you quickly and easily add unique color gradient effects. The Depth of Field tool lets you apply bokeh effects to mimic the subject isolating look of a shallow depth of field image. Several Selection Tools are available to quickly and easily select various subjects for adjusting, retouching, or copying elements of an image. The Fade Correction tool helps to restore the color and contrast from faded photos while a Scratch Remover tool can be used to repair cracks or marks from scans of old prints or negatives. A Red Eye tool lets you quickly remove unsightly red-eye effects and replace it with a natural-looking dark gray color. A variety of Drawing and Painting tools let you apply a range of illustration effects to your images. Besides the 30 new brushes, you can also import your favorite Adobe Photoshop brushes. Additionally, vector illustration tools also allow you to draw with preset shapes and pens. Layers allow you to work in a non-destructive manner and create more complicated photo compositions. Text can be added to any image using a range of typography tools, along with the ability to adjust fonts, size, style, alignment, leading, kerning, and apply effects to creatively adjust the look of your text. A step-by-step guided virtual tour can be used to familiarize yourself with the new features and how best to use them in your editing workflow. Helpful video tutorial libraries are accessible in the updated Welcome tab, as well as a Leaning Page for additional assistance. Integrated social media sharing allows you to post your photos and designs directly to Facebook, SmugMug, Flickr, and Google+ accounts from within PaintShop Pro. Facial recognition technology helps to identify and tag individuals in your photos for easier photo management. Using location tags, you can map your photos to places on a map and share them online. Box Dimensions (LxWxH) 11.4 x 6.0 x 5.8"
Box Dimensions (LxWxH) 9.0 x 6.8 x 4.5"
Box Dimensions (LxWxH) 7.6 x 5.2 x 1.4"
Lumix DC-G9 Mirrorless Micro Four Thirds Digital Camera with 12-60mm Lens and Accessories Kit is rated 5.0 out of 5 by 1. Rated 5 out of 5 by DARRELL from Impressed with features Im a Nikon shooter and bought the Panasonic GX-85 on a whim. I was so pleased with it, I bought the G9. It also has been a pleasant surprise. Fast auto focus, face detection, great colors, sharp and video is excellent. The lens is sharp throughout the range and pairs with video very well. The only negatives so far is the shutter release has a hair trigger and manually setting the WB has been a must most of the time indoors. I have no regrets on my purchase.